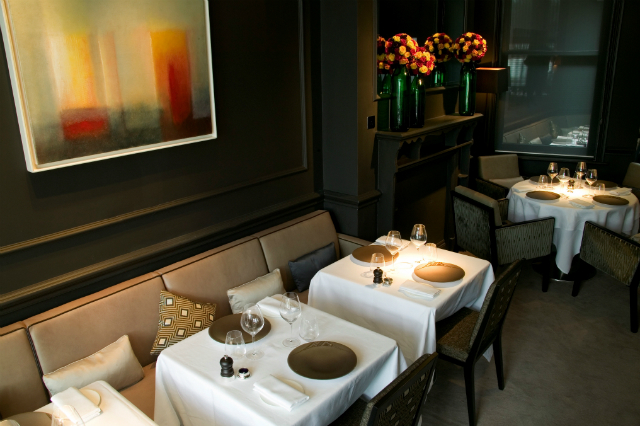 Launceston Place in Kensington is best known for being Princess Diana’s favourite restaurant. Tucked away in a pretty townhouse on a quiet street far from the madding crowd, it’s easy to see why the chicest restaurant within the D&D London stable, which used to be the sister restaurant to Kensington Place, would have appealed to Diana. Its sprawling setting is all secret staircases and cosy connecting rooms. There’s something very homely and private about the space, as if you’re dining at a wealthy aunt’s house rather than a Michelin-starred restaurant – an accolade gained last year mere months after Yorkshire-born head chef Tim Allen began steering the ship after a six-year stint at Whatley Manor in Wiltshire. Approaching the restaurant one balmy August evening, the street was so quiet, it was as if time stood still for a moment. It is so rare to find tranquility in the middle of the city, there was almost something unsettling about it. Expectation hung in the air like the intoxicating perfume of jasmine at night. 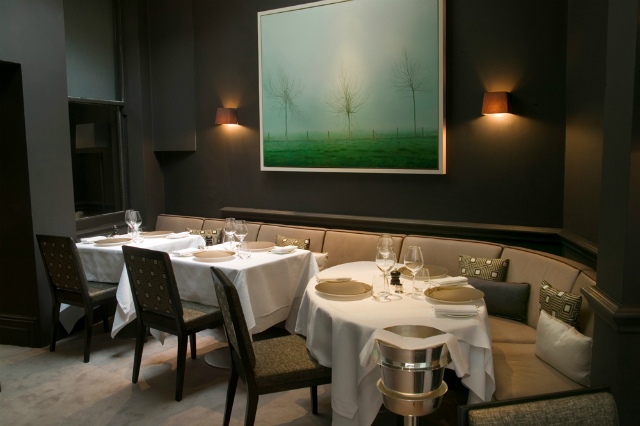 Inside, the colour scheme is muted and safe – banquettes are beige and walls a sombre shade of grey, hung with Hockney-esqe paintings of leafless trees, spindly branches snapping in the wind. The windows however, are large and inviting, lightening both the room and the mood. 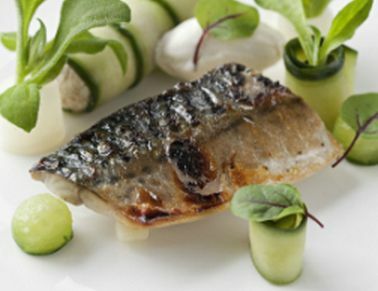 While the building dates back to 1839, Launceston Place opened as a restaurant in 1986 and has lived through a number of incarnations, none of which have veered wildly from its signature offering of refined French cuisine with a British twist. With my dining buddy having bounded through the door, freshly bronzed from a stint in southern Spain, proceedings begin at the bar with a Clover Club sharpener. The barman’s first attempt at the classic cocktail, it arrived bereft of the egg white that gives the gin-based, pastel pink drink its signature texture. Whetting the appetite further were a slate of moreish morsels, including parmesan crisps and croquettes topped with truffle butter that were so good on biting, I closed my eyes in delight, lost in the pleasure of it all. Settling into a cosy banquette, the goodies kept coming – our immaculately attired waiter presenting us with a tiny white cup of tomato and basil gazpacho that had been whisked to within an inch of its life, turning it into what tasted like a tomato flavoured cloud. LP’s Spanish sommelier, Agustin Trapero, seemed keen to show off some of the liquid treasures from his homeland, including a zippy and on-trend Txakoli from Basque Country-based producer Gorka Izagirre that boasted notes of crisp green apple, mouthwatering lime, acacia and a hint of fennel. 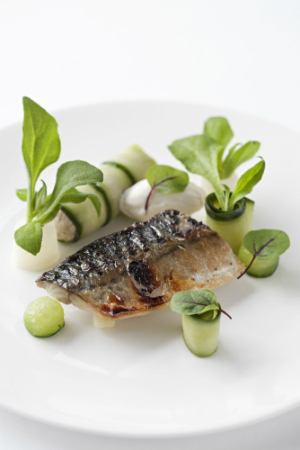 Plates at Launceston Place are well considered and show exquisite attention to detail. My starter: hen’s egg with girolles, peas, Pata Negra lardo and duck fat toast, was an elaborate assault course of a dish full of twists and turns both in appearance and taste, from the gossamer-thin, melt in the mouth lardo to the pleasing crunch of the solider-shaped duck fat toast balancing on the hen’s egg like a seesaw, via the earthy girolles swimming in a pea purée pond. The main event, English veal three ways – loin, sweetbread and cheek –served as an ode to the calf from which it came. All three pieces of the puzzle arrived glistening, as if freshly varnished. Each of the trio had its charm and showed off the flavour arc veal can achieve, from the silky and tender sweetbread, which was just the right side of rich, to the perfectly pink, juicy loin through to the deeply-flavoured cheek, the shards of which fell onto the fork without a fight. The meaty ensemble was sweetened by a splash of Madeira jus, while truffle linguine offered a final flourish of decadence to the dish. Enhancing the experience was a generous glass of Dujac Gevrey-Chambertin 2008, which had an attractive nose of raspberry and cherry balanced by a gentle lick of oak and a savoury finish. Hauntingly beautiful, it was how all good Pinot Noir should be and reminded me of the heights the grape can achieve in the best pockets for it in the world. Glinting ruby red in the glass, while delicate in nature, it made a powerful impression on the mind. Pleasingly full by this point but happy to indulge further, we were wooed by the soft prospects of the generously stocked cheese trolley and found it impossible to resist the lure of gooey, Calvados-soaked camembert and nutty vintage Comté. Dessert came in the form of poached pears, dark chocolate mousse, salted butter caramel and praline soil washed down with one of the finest Sherries on the planet: Fernando de Castilla Antique Amontillado, all nuts and toffee with a salty tang on the finish, which paired perfectly with the salted caramel in the pud. During dinner, I noticed a number of lone diners dotted around the room. Rather than looking sheepish, they seemed happy and relaxed, which is testament to how homely and welcoming Launceston Place is. Nearing midnight, we left the restaurant’s soft beige embrace and headed outside. Having entered to sunshine and warmth, large drops of rain were now hammering down from the heavens.